Whether you're interested in sport as a participant or a spectator, Birmingham has plenty to offer. The city is home to three leading football clubs – Aston Villa, Birmingham City and West Bromwich Albion – and international cricket takes place at Edgbaston, home of Warwickshire County Cricket Club. Birmingham also hosts a number of major sporting championships. The renowned Brabazon golf course at The Belfry, the UK PGA headquarters, has been the venue for several Ryder Cups, and the National Indoor Arena, the UK's top indoor sporting venue, hosts a range of events including Davis Cup tennis, international athletics, badminton, table tennis, judo, basketball and wrestling. If taking part is more your thing, the renowned Alexander Stadium, is open for athletics and gym training and our own £8.5 million Doug Ellis Sports Centre opened in 2010. It houses a sports hall big enough to accommodate eight badminton courts, an 80-station fitness suite, dance and aerobic studios, and a full sized all-weather pitch offering additional sporting facilities. Our other site, The Pavilion at Moor Lane, provides 12 pitches for football and rugby, an all-weather pitch for five- or six- a-side football and hockey, changing facilities and a fully licensed bar for a post-match drink! If you enjoy a round of golf, the Belfry golf course is just 20 minutes from New Street Station. For something slightly different, why not try your hand at skiing? One of the country's best indoor ski facilities, the Snowdome at Tamworth, is only half an hour away from Birmingham. The Students’ Union caters for a wide spectrum of sporting interests; a number of teams and individuals compete in BUCS (British Universities and Colleges Sports) tournaments and leagues. 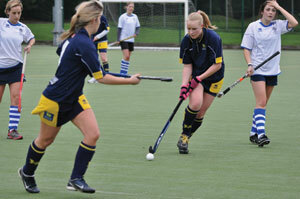 There are also intramural competitions and the opportunity to simply play for fun.